You may be treated to seeing some wildlife during your visit to our monastery. Don't be surprised if you see white-tail deer, pheasants, wild turkey, Canada geese, fox, owls, and other animals like the ground squirrel. They share our love of this land. The beautiful white-tail deer are one of the most pleasing sights we witness from our home. They range from a reddish-brown coat in the summer to a grayish-brown coat in the winter. 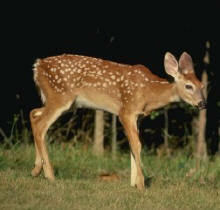 Fawns have beautiful red-brown coats speckled with white spots. Adults hold their white tails erect when sensing danger to alert others. They have a keen sense of hearing which allows them to sense humans at quite a distance. To control overpopulation, these deer are a popular game animal in the fall of the year. This is one of the most common of geese in Canada. They live throughout the majority of North America and love our North Dakota grasslands and stubble fields. They fly in an amazing "V" formation which tells a story of its own in how they care for each other in flight. 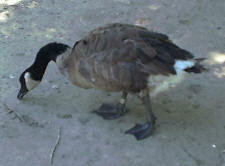 Canada Geese have brownish colored bodies with a long black neck and head. A distinguishing white chin strap is located behind the bill and eye of the Canada Goose. Flocks of geese can be heard from a long way off as their rich, musical honking fills the air as they fly overhead. 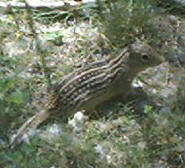 The thirteen lined ground squirrel is a common sight in North Dakota. These pesky, but darling rodents enjoy making a home in pastures, roadsides, and our flower beds! A beautiful pattern of dark stripes and white dots mark the head and back of this little cutie. They are active during the day and hibernate over the winter months. They feast on both plant and animal matter, insects, and seeds. They have to keep a watchful eye overhead as we have several hawks, owls, and eagles with a hankerin' for these "delicacies"! Occasionally, we spot a red fox on our property. In fact, last spring we enjoyed a peek at some playful new fox pups outside a fox den nearby. The red fox has pointy ears which are black on the back, a long snout, and a long bushy red tail with a white tip. The red fox enjoys an open habitat and are not strictly nocturnal so they are sighted frequently during the daytime. Their diet consists largely of rodents, birds and insects. 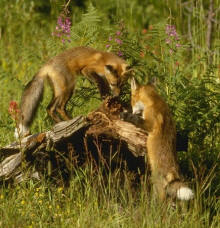 When chased, the red fox swishes its tail from side to side to spread its scent in many directions. This makes it more challenging for its predators to follow. We have not spotted coyotes around the monastery, however, North Dakota farmers can attest to the fact that they’re around. Although typically afraid of humans, the coyote poses a threat to livestock and domestic pets. Coyotes can weigh up to 50 pounds and stand about 20 inches in height. They resemble a large dog with a bushy tail and can survive in very cold climates. The coyote's diet consists of reptiles, small animals, birds and some vegetation. 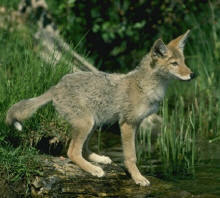 Coyotes are territorial and may stay in one location for many years as long as food is abundant. They hunt both alone and in pairs and have a keen sense of hearing and smell. This commonly recognized owl is distinctive because of its tufted ears that resemble horns. It is large and has a wingspan of up to five feet. 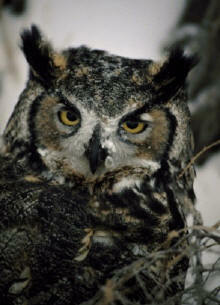 Ranging in color from brown to light gray, the great horned owl nests in mature trees or tree rows. 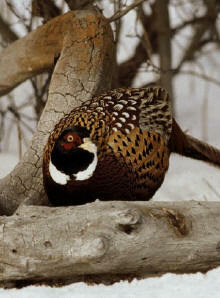 This gorgeous pheasant is another popular game bird in North Dakota. The colorful plumage of the male includes a brilliant green head and a white ring around the neck. Body feathers range from brown, copper, tan, green, and black with a purplish hue. The bald eagle, our regal national symbol, is a beautiful sight to behold. 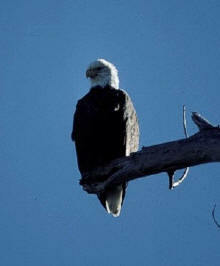 The bald eagle is not bald at all, but rather, has white feathers on its head, neck and tail. They prefer habitats near coastlines, rivers, lakes and wet prairies. 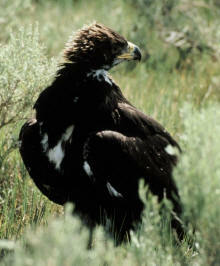 Like the golden eagle, the bald eagle may use the same nest year after year, adding more to the nest at each nesting. One of the sights we appreciate most is that of a golden eagle soaring overhead. They are common to this area, living in trees along the Missouri River. They enjoy hunting the wide open farmlands where there is little cover for its prey — rabbit, fox, snakes, game birds. We share our home with the North American Porcupine. The porcupine is the second largest rodent. They usually weigh between 10 to 40 pounds, and average about 22 pounds. Porcupines are plant-eaters. During the spring and summer, they feed on plants, twigs, and leaves. In the winter, they survive by chewing through the bark of trees and eating the tender flesh below. This often results in the death of the tree. 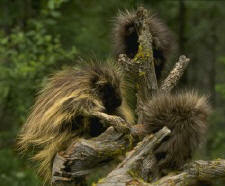 In the wild, porcupines have a life expectancy of 5 to 6 years.